A4U :: Why choose LED technology? You save an average of 70% at your lighting. 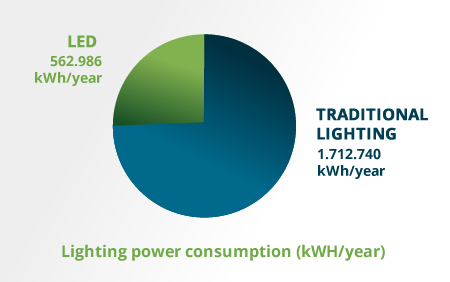 Lighting costs are reduced by an average of 70%. At the same time, the quality of the light is improved, due to its efficiency, which is better than any with other electric lighting solution. The LED technology have an average useful life span is 50 thousand hours, without any influence of switching on and off. A daily use for eight hours may lead to life span of 17 years. If one compares the LED technology life span with the maximum life usage of a fluorescent light bulb, the fluorescent one will reach a maximum of 10 thousand hours, however, that usage can be substantially reduced by switching it on and off. More resistant equipment, solid state technology. Up to 70% CO2 are set free into the atmosphere. 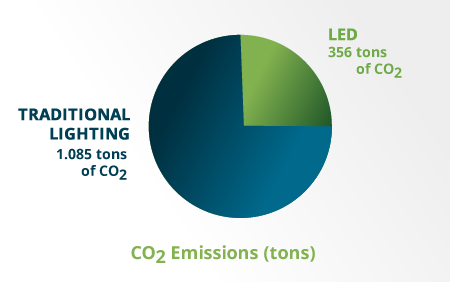 Due to their low consumption, the LED reduce considerably the CO2 emissions into the atmosphere. They do not contain environment damaging substances, such as mercury or lead. They don’t produce UV and infrared radiation. No need of decontamination before being recycled. On the 7th October, 2014, the Royal Swedish Science Academy nominated the winner of the Nobel Prize in Physics 2014. The winners were Isamu Akasaki, Hiroshi Amano and Shuji Nakamura, the three Japanese scientists who invented the blue LED light which, added to the already existing red and green ones, permitted the production of the luminous and cheaper white light. 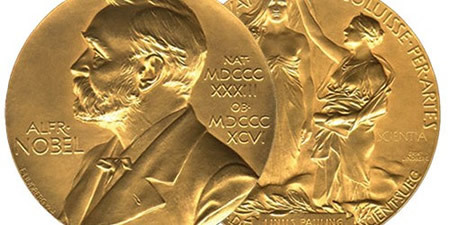 Mentioning the Academy: “The incandescent light bulb lightened the XXth Century; the XXIst Century shall be lighted by LED bulbs” and “to grant this reward for a an area which is more for application than fundamental would have pleased Alfred Nobel”, as he gave his preference to “inventions which would benefit mankind".